Skateboarding is an increasingly popular recreational activity among teenagers-especially young males. Practice skateboarding safely and use protective equipment. It is a fun and healthy sport that can give you a low-impact aerobic workout. To improve skateboarding safety, a growing number of communities provide supervised skateboard parks. These may have professionally designed "bowls" and "ramps" or other designated skateboarding areas that are located away from motor vehicle and pedestrian traffic. Most hospitalizations involve head injury. Even injuries that heal quickly can cause pain and anxiety, cost time, and money and may lead to disabilities. This can include loss of vision, hearing and speech; inability to walk, bathe, toilet, dress or feed yourself; and changes in thinking and behavior. Skateboarding is not recommended for young children. That's because they are still growing and do not yet have the physical skills and thinking ability a person needs to control a skateboard and ride it safely. * Children under age 5 years old should never ride a skateboard. * Children aged 6 to 10 years old need close supervision from an adult or trustworthy adolescent whenever they ride a skateboard. * A higher center of gravity, less development and poor balance. These factors make children more likely to fall and hurt their heads. * Slower reactions and less coordination than adults. Children are less able to break their falls. * Less skill and ability than they think. Children overestimate their skills and abilities and are inexperienced in judging speed, traffic and other risks. * If you don't use protective equipment. * If you don't keep your skateboard in good condition. * If you skateboard on irregular surfaces. * If you attempt "tricks" beyond your skill level. * Inexperienced skateboarders. Those who have been skating for less than one week suffer one-third of injuries, usually caused by falls. * Skateboarders who do not wear protective equipment. Every skateboarder should wear standard safety gear. This includes a helmet, wrist guards, elbow and knee pads and appropriate shoes. Skateboarders who perform tricks should use heavy duty gear. * Skateboarders who go near traffic or use homemade skateboard ramps. Both activities are particularly dangerous. * Experienced skateboarders who encounter unexpected surfaces or try risky stunts. Irregular riding surfaces, rocks or other debris can cause you to fall. You can stumble over twigs or fall down slopes. Wet pavements and rough or uneven surfaces can cause a wipeout. Avoid risky behavior. Don't skateboard too fast or in dangerous or crowded locations. * Injuries to the arms, legs, neck and trunk range from bruises and abrasions to sprains and strains, fractures and dislocations. Wrist fractures are quite common. Wearing wrist guards can reduce their frequency and severity. * Severe injuries include concussion, closed head injury and blunt head trauma. * You can suffer permanent impairment or even death if you fall off the skateboard and strike your head without a helmet. Most brain injuries happen when your head hits pavement. You are most at risk if you skateboard near traffic and collide with motor vehicles, bikes, pedestrians or other obstacles. Skateboards have three parts-the deck (the board itself), the trucks (the mechanism to which wheels are attached) and the wheels. Shorter decks are best for beginners because they are easier to balance and handle. Skateboards have various characteristics for all types of riding including slalom, freestyle and speed. Some are rated for the user's weight. You should inspect it before every ride. Look for problems that need repair. These can include loose, broken or cracked parts; sharp or jagged edges; a slippery top surface; wheels with nicks and cracks, etc. Get professional help to repair serious defects. Also learn slowing and turning techniques, and how to fall safely: If you are losing your balance, crouch down on the skateboard so you won't have as far to fall. Try to land on the fleshy parts of your body rather than your arms. Relax and roll. 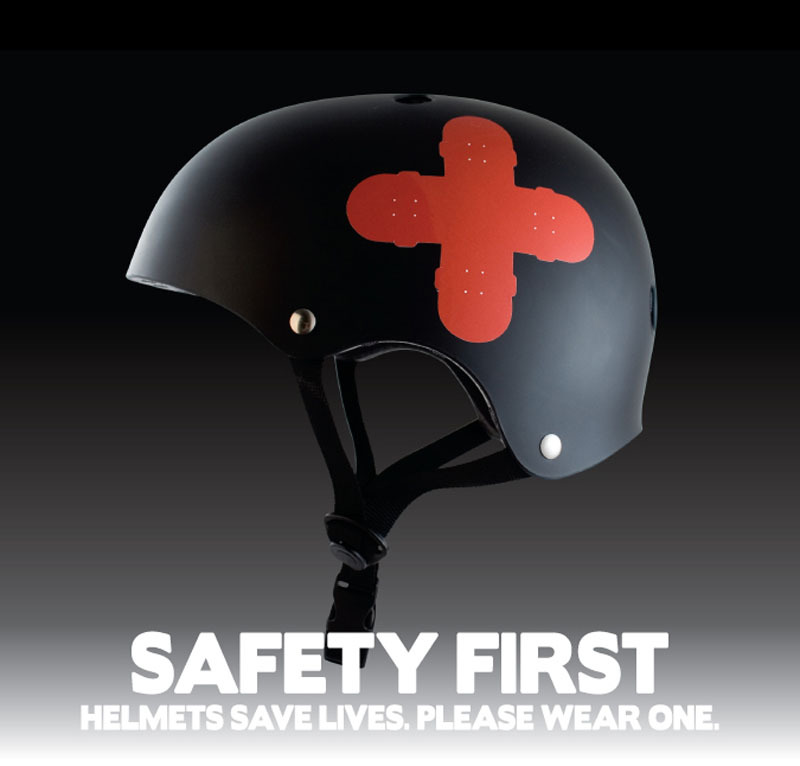 Replace your helmet when it is damaged, outgrown or at least every five years. You may need to replace it sooner if the manufacturer recommends it. Note: Effective January 1, 2003, California has expanded its bicycle helmet law to require that children under age 18 wear helmets each time they use a skateboard, inline skates, roller skates or scooter, making the state's child helmet law the strictest in the nation. Violators face fines of $25, most of which benefits local health departments promoting helmet safety education and subsidizing helmet purchases for low-income families. Wrist guards help support the wrist and reduce the chances of breaking a bone if you fall. Knee and elbow pads reduce the severity of cuts and scrapes, and prevent gravel burns. You should also wear closed, slip-resistant shoes, and consider goggles to keep debris out of your eyes. Skateboard only on smooth pavement away from traffic, preferably in a supervised skate park. * Never hold onto the side or rear of a moving vehicle while riding a skateboard ("skitching"). You could fall or be thrown into oncoming traffic if the vehicle suddenly slows, stops or turns. * Never use your skateboard in wet weather. * Avoid skateboarding in crowded walkways or in darkness. * Always screen the area before you skateboard, inspecting surfaces for rocks and other debris. Skateboarding skill is not acquired quickly or easily. Don't take chances by skateboarding faster than your experience allows, or faster than is safe for conditions or the speed of other skateboarders. If you try tricks and jumps, practice them only in a controlled environment, such as a skate park that has adult supervision and appropriate access to emergency medical care. Prevent skateboarding injuries by keeping in top physical condition. Stretch and do conditioning exercises before and after skateboarding. Be considerate of fellow skateboarders, especially those who are younger and / or less skilled. Skateboarding accidents happen, so you should always know what to do in emergency situations. Don't panic. Call 911 for medical assistance or an ambulance.